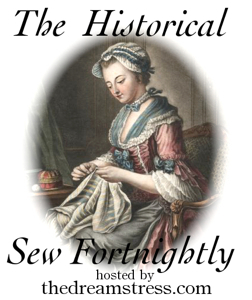 This weeks challenge for the HSF was nr 11 and called “The politics of Fashion”. 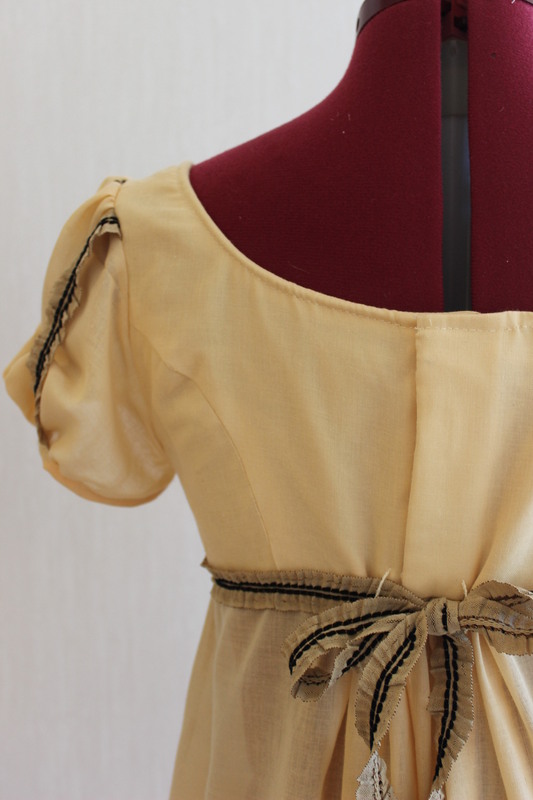 Going into this years sewing I already knew I wanted a new regency dress, and since I can’t even look at the sheernes of the empir-gowns without thinking about the french revolution, Napoleon and everything in between, the choise of challenge was an easy one. For those who don’t know, the style emerged from a mash up of: ladies freeing themself from the restrictive fashions of the 18th century, and the dream of a democratic state most like the one in ancent greece. 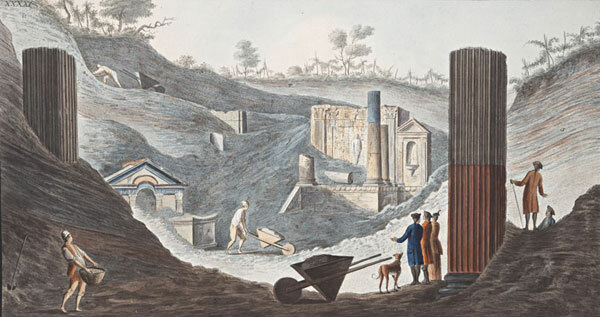 (The fact that the two citys Pompeii and Herculanum was just discovered beneath the ashes of mount Vesuvius, did their part in the sudden cravings for everything greek/roman styled I’m sure). 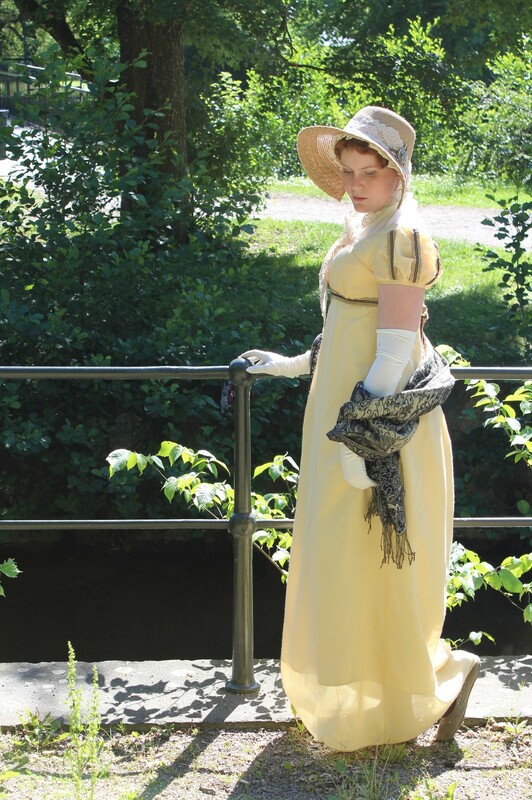 I also had one other reason for picking this style of dress: I needed to try out some patterns for the regency sewing course I will be hosting this autumn. 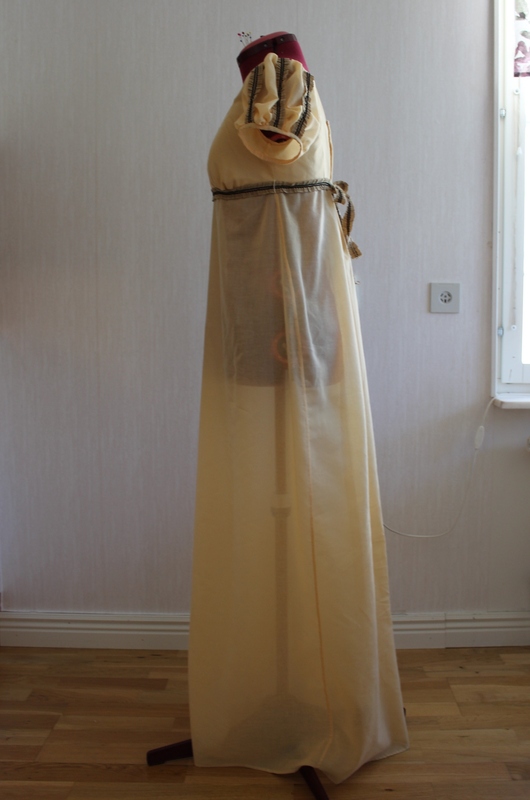 So, after some searcing for suatable dress types, patterns and fabrics, I decided on this lovely yet stylistic shape as inspiration for my gown. 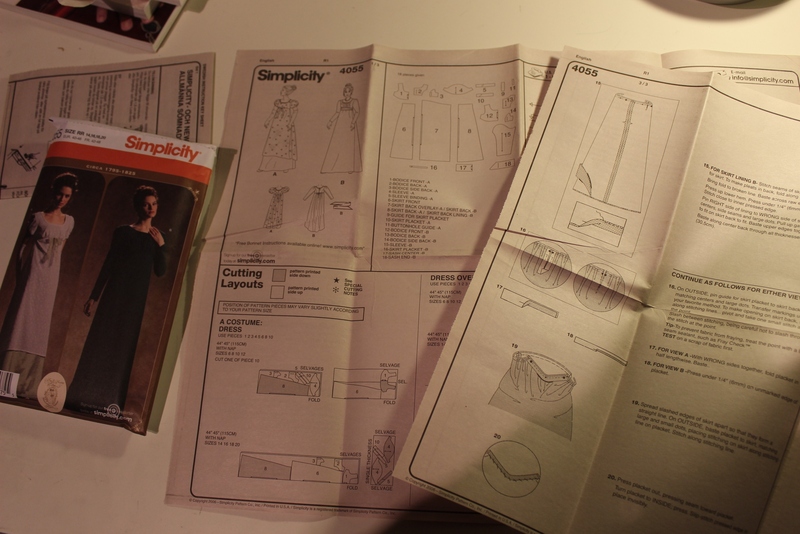 Using the Simplicity 4055 pattern. 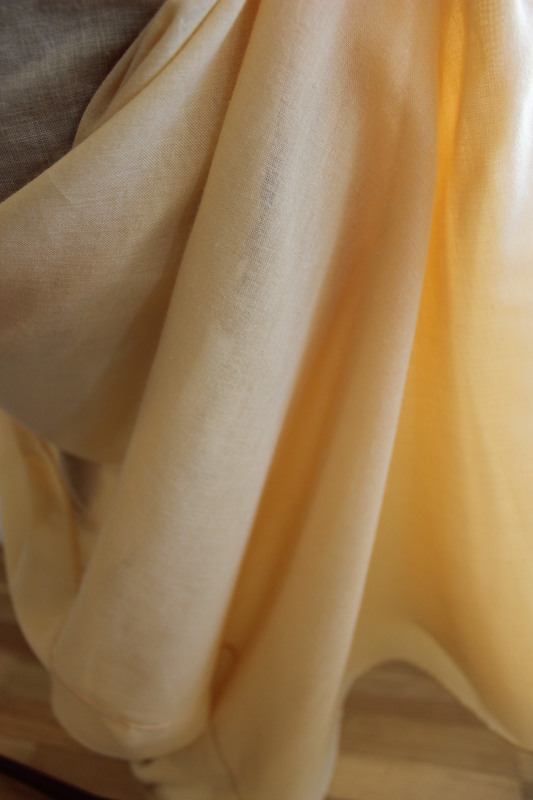 And a soft light yellow cotton voile I found in my stash. 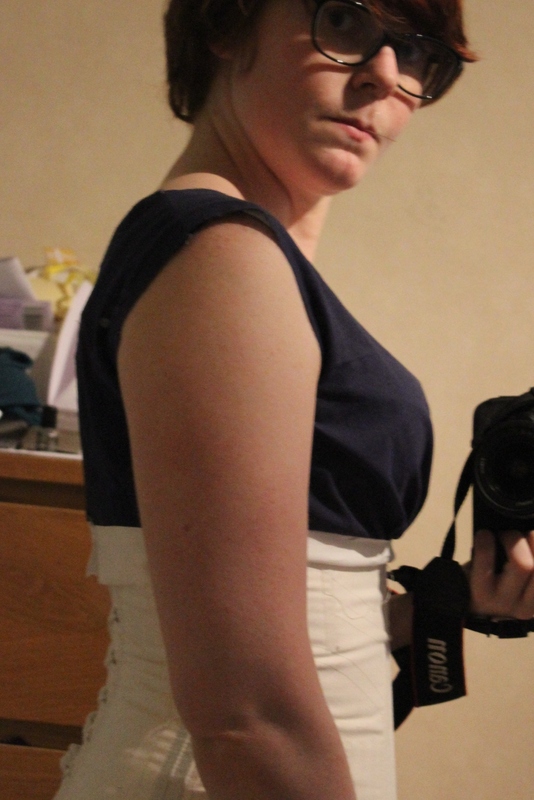 Putting that aside, I continued making the mock-up, and tried it on. It looked pretty good, and only needed some smaler tweeks. So on to the fashion fabric. 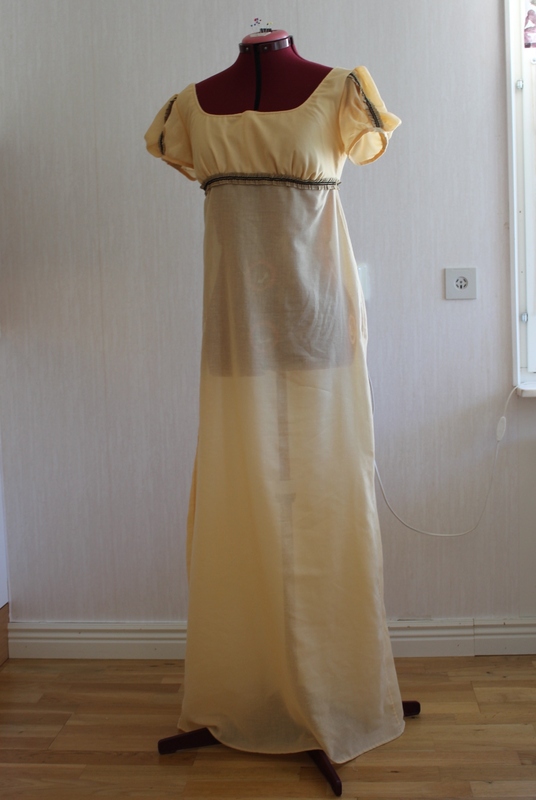 And since I only had about 1,5 m of the voile, I relinquised from the pattern and drafted a slim skirt with only a litle gatering at center back (instead of the large skirt panels originaly recured). 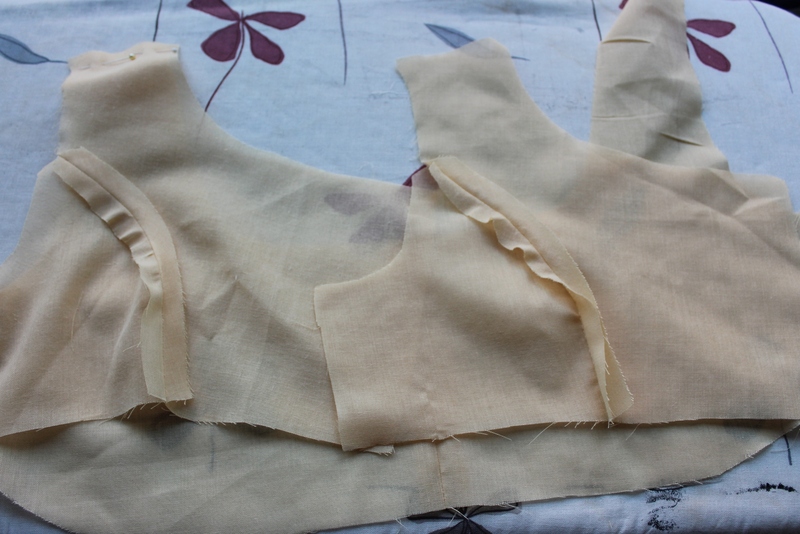 Then I cut the bodice , basted the soft ivory cotton used for interlining to the bodice pieces, and pinned everything togeter. 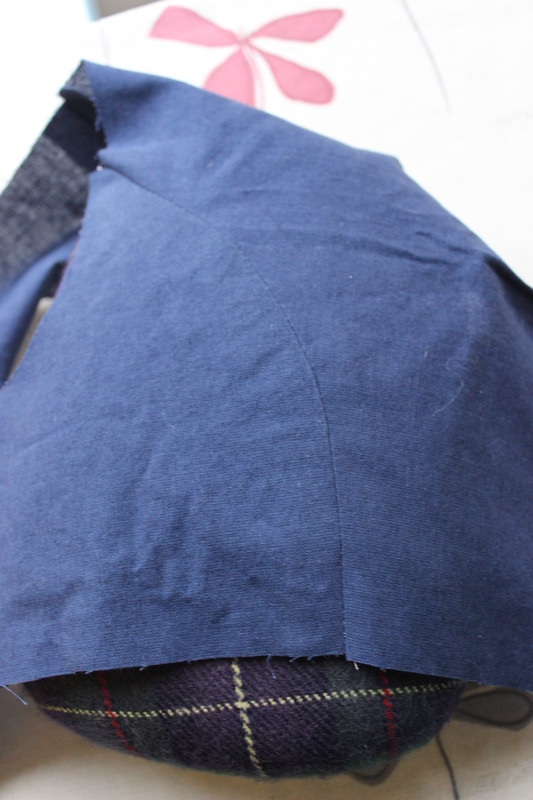 My ambition was to make the wole dress by hand, so I stiched the skirt, bodice and sleeve pieces togeter and felled all the seams. 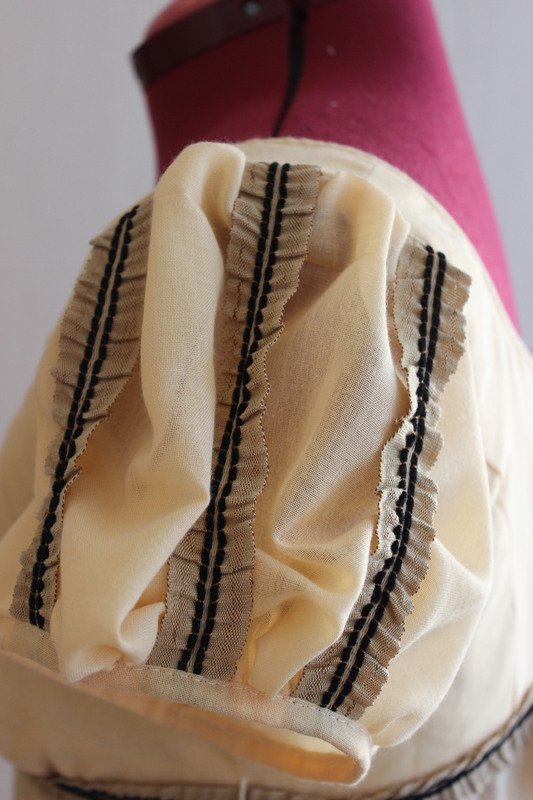 I gatered both the skirt waist, the bust draping and basted the puffsleves. Then I run out of time. 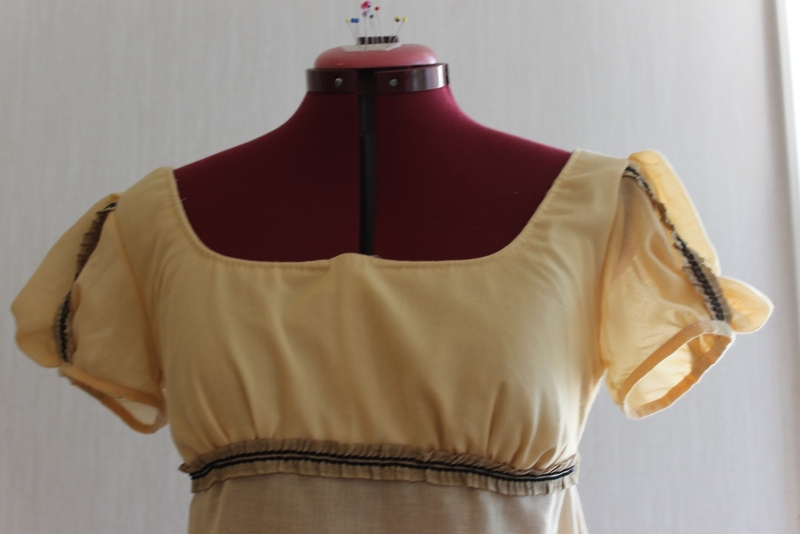 And when I realised, the day before the dance recidal, that I sewed two right back pieces, I gave up and treaded my machine. From there on it went pretty fast. 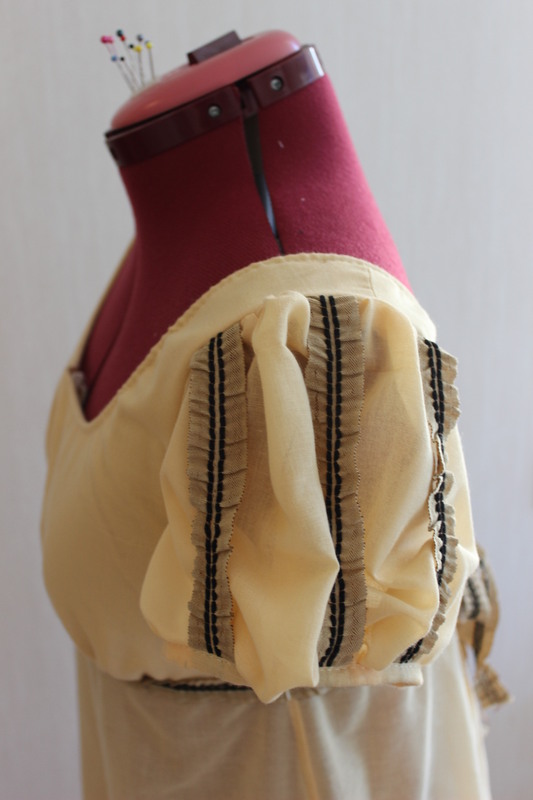 I sewed he bodice to the lining and set the sleeves. Decorating them with rows of trimming to make them even puffier, and ending them in smal self made bias strips. 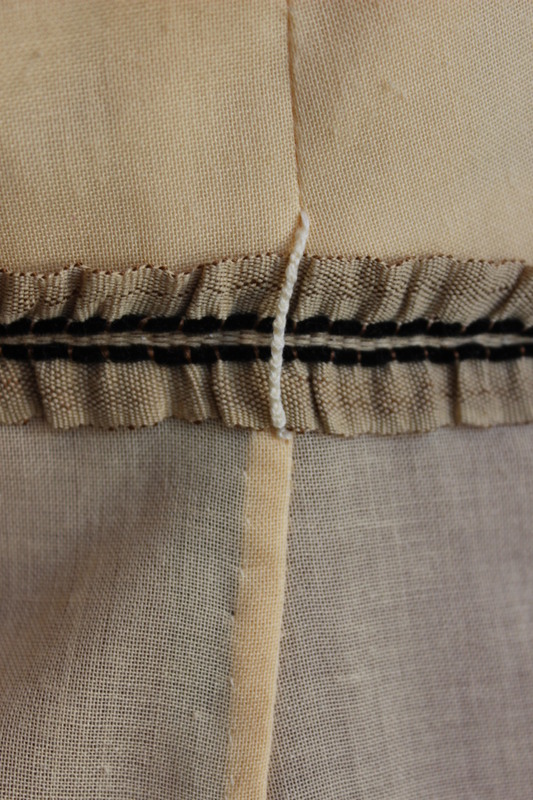 I worked some eyelets to the front lining, and stiched a chanal for the gatering-cord on the upper edge of the bodice. 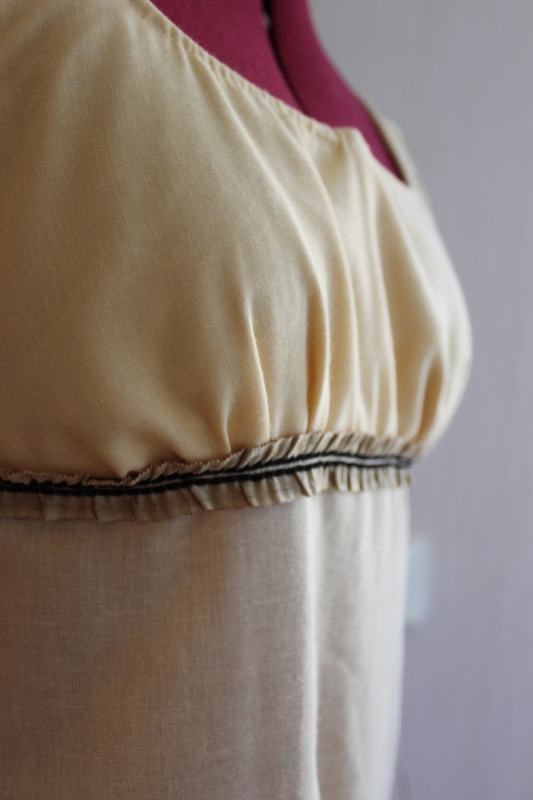 Then I attached the skirt to the bodice, put on some hooks and eyes for clouser, cut the lenght and sewed the hem (finishing about 10 minutes before I needed to put it on to be able to go to the recidal). 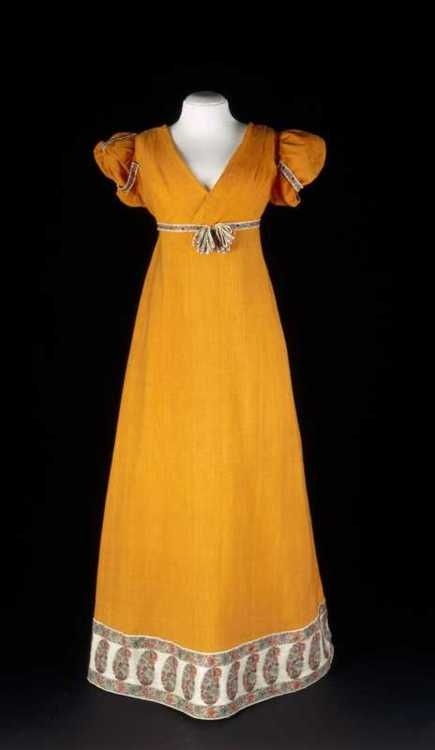 What: An early 19th century regency gown. -The opulance in fashion in the upper class leading up to the french revoultion. 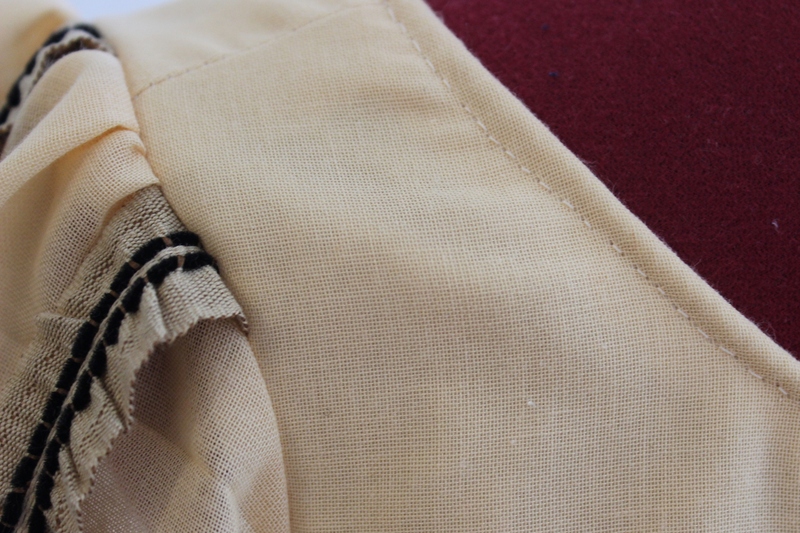 -The introduction of the cheeper, more light weight indian cotton now being avalible to people all over europe. -And the discovery of Pompeii and Herculaium, creating a dream of the ancient democracy, and a thous new cravings for more draped greecian clothing. 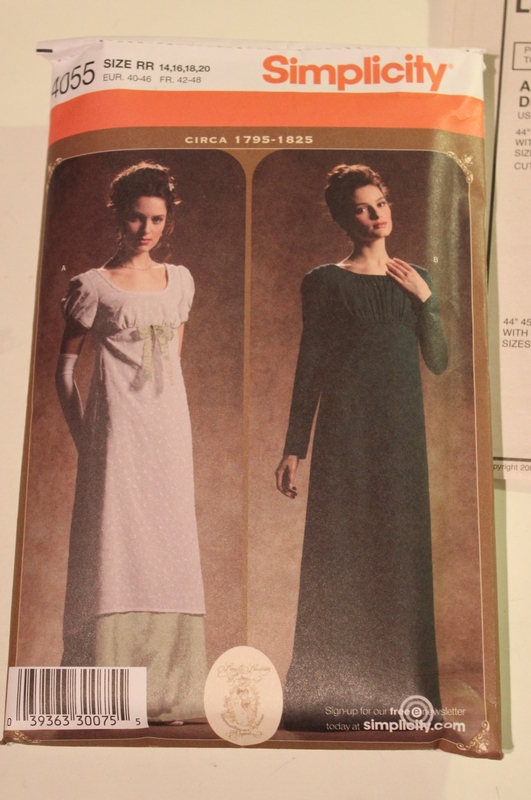 Pattern: Simplicity 4055 regency gowns. 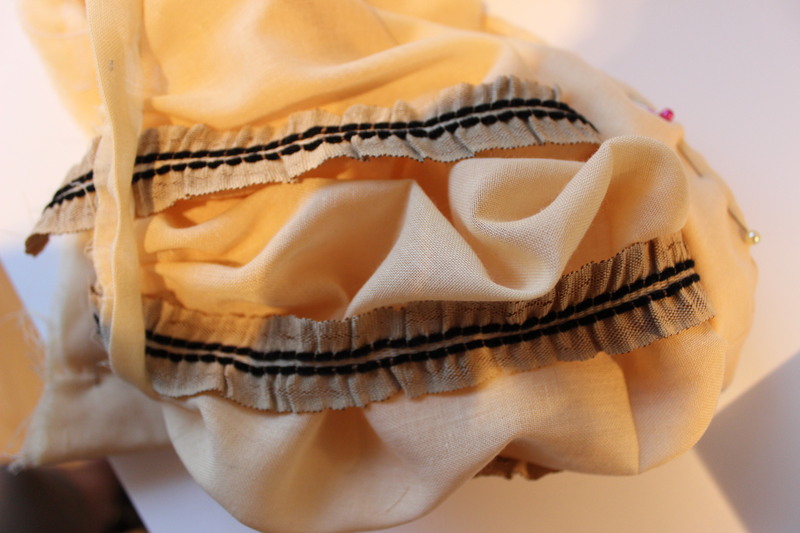 Fabric: 1,5 m of light yellow cotton voile, 0,3 m of thin ivory cotton for interlining. 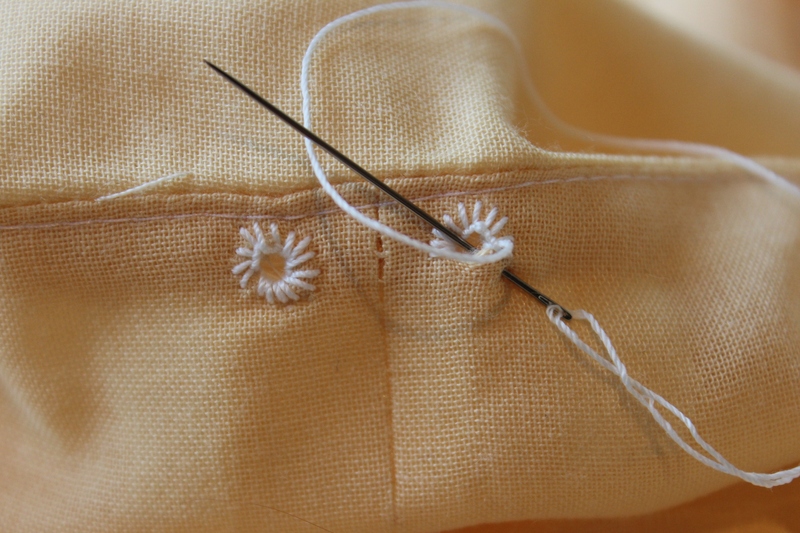 Notions: Thread, buttonhole thread, hooks and eyes, 1m of cord and 2 m of decoation trim. 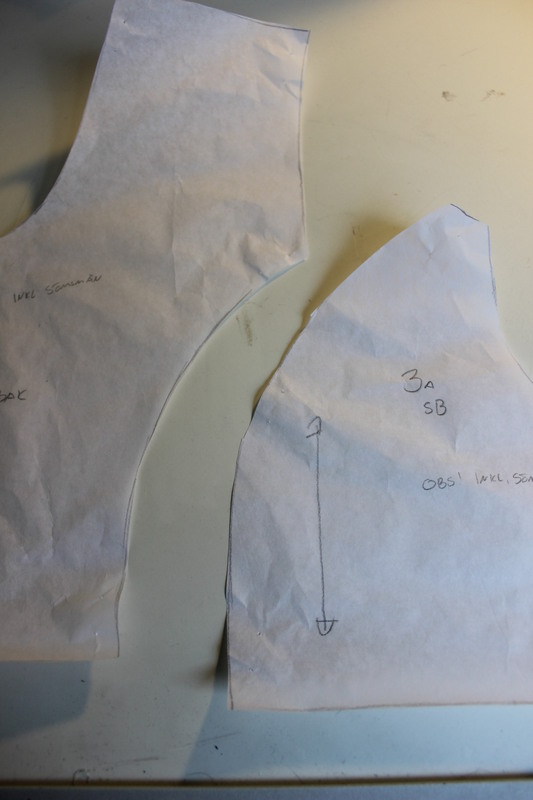 How historical accurate: The pattern are supposed to be from an autentic sorce, but since I adapted it to my likning and fabric measurments I really don’t know anymore. The fabrics and ribbons are right, but since some of it are made on the sewing machine I would say 6/10. Cost: No more than 100 sek (16 Usd). 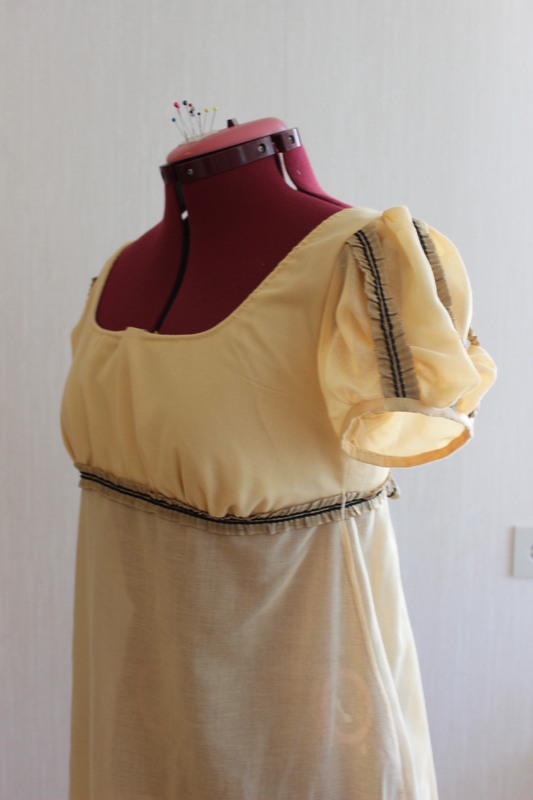 Final thoughts: I wished I would have had a bit more fabric for the back gahtering, and also that I would have taken the time to get the bust gatering in the right place (now they are a bit to far at the sides, making the bodice line look a bit bulky). But otherwise I like the it a lot, even though it reminds me of bumblebees a bit with the darer stripes. And I’m happy that the pattern turned out to work so well. Oh what a lovely new dress! 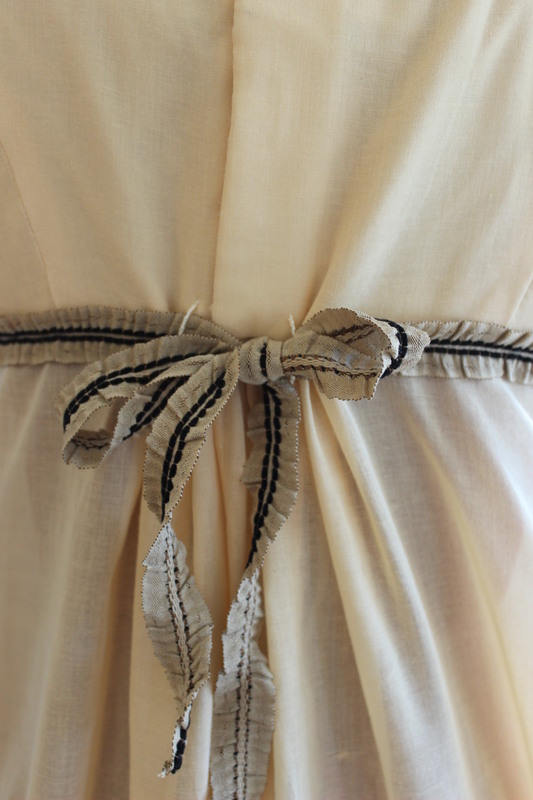 The pale color is beautiful especially with your choice of trim! 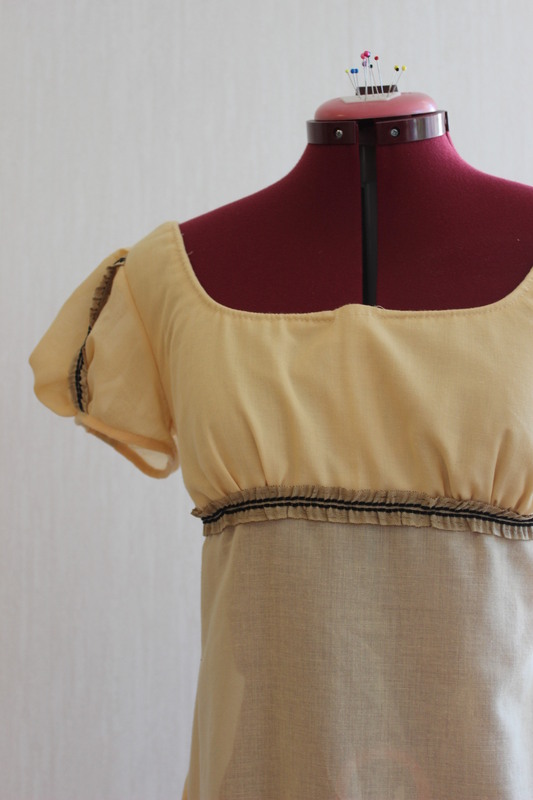 I love that color of yellow…so pretty and feminine! Very well done! 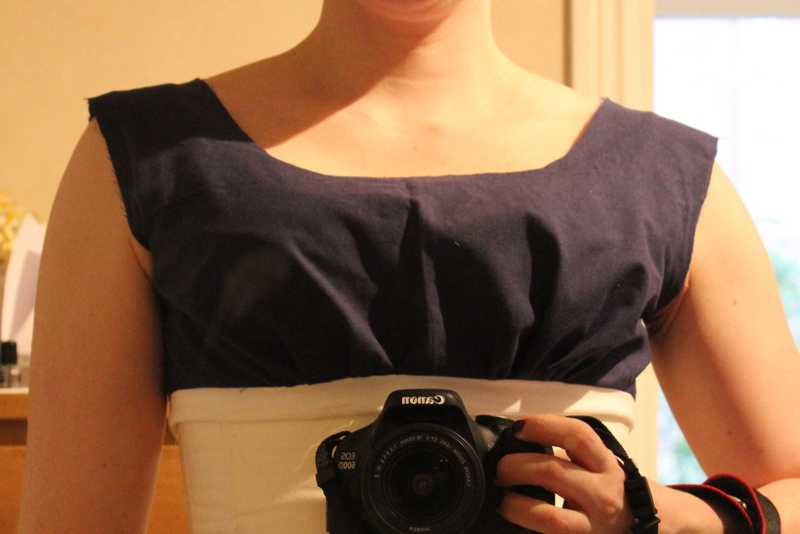 I was very unsure of how the trim and fabric would look togeter, but I realy like the result – so thanks. There’s nothing wrong with bumblebees! 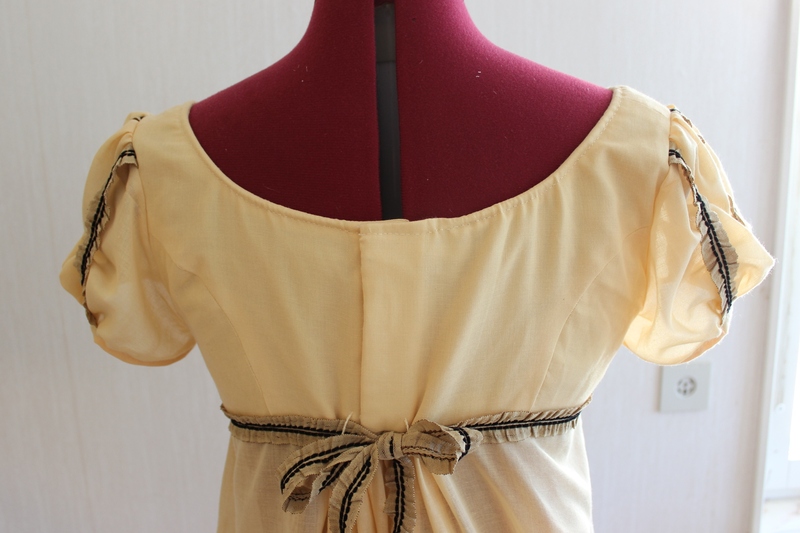 The gown is very pretty, and I love this soft yellow color on you.